I had a question emailed to me recently asking about what Jesus would have used for the bread and wine during the last supper. Of course, those are the elements that make up our communion, or memorial. The bread He used would have been the matzoh prepared for Passover specifically. At the time, it was hand made, without yeast (which represents sin). The wine used was probably a bit weaker than our modern wine, but because of the fermentation process and the time in which Jesus lived, it surely did contain alcohol. As for what we “should” use today, or the closest we could get, would probably be Kosher for Passover matzoh and for Passover wine as well. I don’t believe we should be legalistic about the elements used; however, the symbolic nature of these specific elements always help me to focus on Christ, and to see how He completes the images of Passover. Here is one of my articles that goes into the details of Matzoh: The Bread As for what a church can use, I personally think some type of unleavened bread is only proper, though, again, it is a symbol and not to be turned into something legalistic. I personally think members should be given a choice between juice and wine, since there are good reasons why some people don’t drink, as well as juice being available for those under 21. I’m giving a concrete example of another issue in Communion today. These words of Christ are indeed important ones. These words are part of the scriptural support that many from a Roman church background give in support of transubstantiation. They have a right, and a duty, really, to take these words very seriously; but are we to take them literally? It’s possible. But, as always, we must look at other possibilities, such as figures of speech for illustrating purposes. Figures of speech are used in scripture; metaphors and parables quite regularly. In trying to explain why Christ used such strong statements; this is My Body, this is My Blood, I’ve always known precisely what I’m trying to get across, the question was what was a good example of this language when used in metaphor. First, it is important to point out that I do indeed take His words seriously, but I believe context, and the whole context of scripture does not support transubstantiation; I touch on Jesus’ words here in my second part in my posts on transubstantiation. But do we, as humans and as “teachers” ever employ such strong words in non-literal, analogical language? The answer is yes we do. I was pondering over what example would be a clear one, and then it hit me…a blast from my past. I remembered seeing these commercials on TV quite regularly as a kid. Note the language that is used, along with the visuals; this is meant to make a lasting impact and give people a visual cue to go off of. Do we have visual imagery used in conjunction with Jesus’ words; This is My Body, This is My Blood? Yep. My last post was on the Matzoh used in this instruction from Jesus. Matzoh being a visual picture of Christ’s body. The wine, red wine, is a visual of His blood. When He said these words, He held up the visual symbols. “This is drugs.” Is that literally drugs in that pan? Of course it isn’t; it’s sizzling grease. “This is your brain…” Is that literally a person’s brain? Nope; it’s an egg. The point is this shows a perfect example of this style of language, and also shows why it is used. Humans are very visual creatures, and it is a lot easier for us to remember things when they are “attached” to visual images. Christ knew this very well, and so, taught His disciples what He wanted done in remembrance of Him, and to show Him forth in a visual, as well as verbal way…as in the commercial, they were not to be taken literally, but figuratively. Of course the answer can be found in the Jewish roots of our faith, and the time of the feast of Passover (and preparation for it, and the feast of unleavened bread) which Jesus and the disciples would have been in the midst of. Would He have had a perfectly round, white wafer, such as the RC uses in their celebration of Mass? Would it have been a big loaf of white bread, full of yeast as used in some churches? No; it would have been Jewish Matzoh (AKA: Matzah, Matsah, Matzo, or Matza). It would have been Matzoh specially prepared for Passover. Matzoh is unleavened bread; bread with no yeast, or leavening agents. Why is this important? Well, first of all, yeast or leaven represents sin. During the time leading up to Passover, Jewish families would purge all yeast from their houses. Why else? Because Jewish Matzoh paints a visual picture of Christ Himself, and it explains in more depth Jesus words; this is My Body. Matzoh is unleavened, representing Christ as having no sin. It’s appearance is striped, bruised, and pierced; as His body would become for us. In the picture above, you can see the striped appearance, and the bruised appearance, and if you held a piece up to the light, you can see light coming through the piercings in the bread. Within the Passover meal, there is a particular piece of Matzoh used (I’ll explain all the images in Passover a bit more at some later date), that is hidden, then taken out, and broken. It was this piece of Matzoh that Christ would have blessed and broken. The blessing would probably have gone something similar to this: Blessed art Thou, o Lord Our God, King of the Universe, Who brings forth bread from the earth. If you hear the resurrection in this blessing, you are spot on! Notice that the bread was indeed broken. This bread is like a thin cracker and breaks quite dramatically. It was all a visual of what Christ’s own body would go through for us; He would be bruised, striped by the cruel whips of the Romans, pierced by nails, and a spear…His body broken (not His bones, but His body, His flesh); He is sinless, as the bread is unleavened. This bread is again, like a picture. I do think that using Matzoh aids us in remembering Christ’s sacrifice, as we have a picture, or a type of Christ right before us while partaking…and after learning a lot of this from Levitt Ministries I do prefer to partake of Matzoh in communion when and where possible. Again the aim of communion is to “keep our eyes” on Christ, and remember Him. 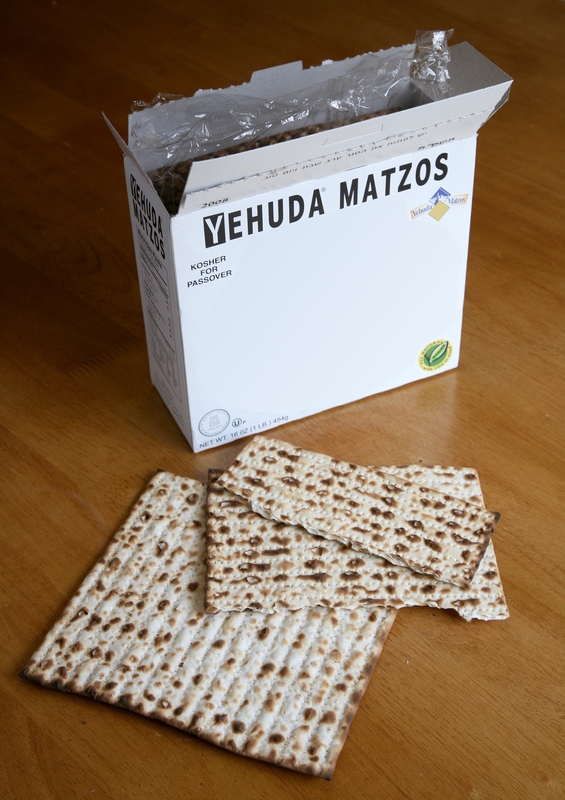 If you are interested in obtaining some Matzoh, either for your church, or for home communion, or just for studying/eating, you can find it at larger grocery stores, or if you are like me and live in a very rural area, you can find “for Passover Matzoh” online. Some Matzoh is cleared by Rabbi’s for Passover use, and some is not (just look on the box). The difference is in how long it takes to make. Often times you can only get Matzoh marked for Passover use around…well, Passover. However, I’ve been able to find it online all year round. I was going to write about Morality and Ethics in the season ender of Doctor Who for today…but as I thought about the show I actually was drawn to write about something else…something a bit more serious. The show really did bring this to mind, with the Holy Spirit’s help I believe…remember I’m a fan of being on the look out for the “sacred” in the “secular.” One of the scenes in the Doctor Who finale involved a character pledging to remember the Doctor, and honor his memory…to carry it on in a way, as the Doctor is about his business. Within Christianity, in the act of communion; the taking of the bread and wine, we are to remember Christ at His own command. He makes it into an imperative; do this in remembrance of Me. We know how serious this is, as Paul underlines the fact that we need to partake in a worthy manner. As I explained in a previous post, this verse has been misconstrued by different preachers to mean that we as humans must be worthy to partake; not so. See my previous post here for more detail on that: Communion; Unworthily vs. unworthy. Paul also teaches: 1 Corinthians 11:26 For as often as ye eat this bread, and drink this cup, ye do shew the Lord’s death till he come. And that verse is what struck me as I mulled this over. I realized an important point; we are not just showing the Lord’s death to our fellow humans, though that is important too. There are others watching as well; the holy Angels, the fallen angels, The Father, Son, and Holy Spirit; God Himself. Communion is one of the ways we communicate and act on our faith…think of it from Jesus’ point-of-view in the limited way that we can. We partake to remember Him, to Honor Him, and to show Him. While we partake the object of our remembrance and honor is right there with us, as He always is. But think how He must feel amongst us as we do so! I don’t know about you, but as I read about the time when Jesus went to pray and asked Peter, James, and Mark to stay and watch and they fell asleep as He prayed. I have to admit I ask myself, “would I have been able to stay awake in the same situation?” Jesus wanted their company, and asked them to come, yet they fell asleep in an hour when He did not wish to be alone. He’s asked us to partake of bread and wine…and I think it gladdens His heart when we actually do so with our focus on Him…when we stay “awake.” Again, I don’t believe one must take communion in a group, or even in a church (that is another post for another time), but I think it is fascinating to dwell on the fact that even if one is alone in their house partaking, they are still showing Him forth, and also fulfilling Christ’s command. We are also showing Him forth to ourselves; it helps us to remember Him, and increases our faith because it is an act of faith. I don’t mean it in the “presenting the sacrifice to God” as the Roman church teaches; far from it…I’ve always found that a bit arrogant; the High Priest Himself is who offered up The Sacrifice, and it was only done once, and only had to be done once. No, we are showing forth, not offering up. But, think about us, we enjoy it when someone remembers something hard that we have done for someone else, and that feeling of joy and acknowledgment surely is no sin. We are remembering Christ’s life, death, and resurrection that were for us, to save us, to redeem us. His body broken in horrible ways symbolized by the broken bread, and His blood shed for us, for the remission of our sin symbolized by the wine. When we remember, honor, and show Him forth, surely that makes Him glad of the remembrance…in fact, think of the Father, Son, and Holy Spirit looking on. This same idea would hold true for baptism as well…we should not forget that while our fellow humans can be present, our audience is not limited to them. This idea should also raise within us the awareness that these things are not light matters; they are very serious indeed. This ties in to a post that I need to write soon; home communion and the fact that you can partake in your home even if you don’t attend an organizational church. We should not allow that fact to stop us from showing forth Christ, and following His command that we partake in remembrance. I discussed the doctrine of transubstantiation in two parts which you can find here; pt. 1 & pt. 2. I mentioned that I was going to comment on Paul’s injunction about taking communion unworthily, and that we are to examine ourselves. Throughout different denominations, teachers have been misusing these verses to try to lay a guilt trip on people for their sin when partaking of the bread and wine; however, if one looks at the verses in question, things start becoming clear. We are indeed to examine ourselves, and we are not to take unworthily, but what exactly does this mean? 1 Corinthians 11:27 Wherefore whosoever shall eat this bread, and drink this cup of the Lord, unworthily, shall be guilty of the body and blood of the Lord. 28 But let a man examine himself, and so let him eat of that bread, and drink of that cup. 29 For he that eateth and drinketh unworthily, eateth and drinketh damnation to himself, not discerning the Lord’s body. I hold that the bread and wine are symbols (not “just” symbols or “mere” symbols, but symbols full of meaning, that serve several purposes), as taught by Christ and Paul (and even James indirectly). However, there is power in the act, or in the taking. Why do I say this? Because one can eat and drink temporary “damnation,” or rather rendered judgment (in the Greek; krima), or sickness on themselves, according to Paul. Eating and drinking without remembering Jesus and His sacrifice leads to this. Of course, in Paul’s example, there were people eating and drinking the bread and wine after they were drunk, and/or they had come to have a full meal together, and did not set apart the bread and cup, but rather drank and ate hungrily without thinking on Christ. They weren’t taking it worthily…in other words they were partaking in an unworthy manner. The Greek word used for “unworthily” is anaxious, which is an adverb describing the act (remember, adverbs describe verbs, not nouns), not the person. Worthiness in this context is not about the person taking the communion, it is about how it is taken. We aren’t to examine ourselves before partaking, we are to remember Christ. So, from scripture, we are not to examine ourselves, for worthiness, that takes our “eyes” off Christ, and puts them on ourselves. The only way to take unworthily is to take not remembering Christ’s sacrifice, and by so doing, we fail to remember Him and fail to show forth His sacrifice. So to examine ourselves means to make sure we’re remembering Christ, that we aren’t just eating because we’re hungry (or drunk). None of us are worthy, as far as that goes, so there’s no examination necessary when it comes to our being unworthy. Anyone who tries to get people to examine themselves for things like sin when partaking of the bread and wine are doing the very thing Paul warned against; taking our “eyes” and minds off of Christ, and neglecting to take in rememberance of Him. Now, there is a responsibility on the part of the person taking the bread and wine to realize what it is symbolic of…this is why non-Christians should abstain from taking communion; they don’t believe in Jesus as the Son of God, and therefore would not be partaking in remembrance and faith in Him, nor to show forth His body, broken for us, and His blood shed for the remission of our sin. Again, I look forward to going more in depth about how Passover fits in with communion, and remembering Christ’s sacrifice for us in a later post. I owe much of this teaching and understanding to the late Dr. Gene “Doc” Scott…his teaching on this idea has helped to refocus believers hearts and minds onto Christ. If a person’s sins were going to stop us from taking communion, none of us could partake. Communion, or the taking of the bread and cup is one of the straightforward symbols and acts that Christ Himself instituted, and instructed us as believers to do. I focused solely on John 6 in the first part in regards to transubstantiation, and I’m going to pick up where I left off, and also move on past John 6 to show other evidence that transubstantiation contradicts scripture. At the end of Jesus’ discourse in John chapter 6, in which He used symbolic language to get His point across, many of the people that had been following Him left. The ones who left Jesus when He made the Bread of Life speech were the ones that misunderstood Him. The ones that left Him took Him literally. The Roman church (RC) POV would have us believe that the ones who left Him understood Him perfectly. This isn’t so. We have scriptural evidence that when people got angry at analogies used by Jesus, they were NOT understanding. John 2:18 Then answered the Jews and said unto him, What sign shewest thou unto us, seeing that thou doest these things? 19 Jesus answered and said unto them, Destroy this temple, and in three days I will raise it up. 20 Then said the Jews, Forty and six years was this temple in building, and wilt thou rear it up in three days? Matthew 13:10 And the disciples came, and said unto him, Why speakest thou unto them in parables? 11He answered and said unto them, Because it is given unto you to know the mysteries of the kingdom of heaven, but to them it is not given. 12For whosoever hath, to him shall be given, and he shall have more abundance: but whosoever hath not, from him shall be taken away even that he hath. 13Therefore speak I to them in parables: because they seeing see not; and hearing they hear not, neither do they understand. Now, we also have the timing and positioning of the words in other scripture to show that the bread and wine are symbols. Mat. 26:26 And as they were eating, Jesus took bread, and blessed it, and brake it, and gave it to the disciples, and said, Take, eat; this is my body. 27 And he took the cup, and gave thanks, and gave it to them, saying, Drink ye all of it; 28 For this is my blood of the new testament, which is shed for many for the remission of sins. 29 But I say unto you, I will not drink henceforth of this fruit of the vine, until that day when I drink it new with you in my Father’s kingdom. Note in verse 29 that the Lord says; I will not drink henceforth of this fruit of the vine. It does not say blood, and this verse follows the blessings. He labels it fruit of the vine even after the blessing. The blessing is where the Roman church sees the transubstantiation as happening; however, from scripture we can see this isn’t accurate. Jesus is still at the table, the goblet of wine is still there and He labels what they’ve just drunk together as fruit of the vine. 1. Cor. 11:23 For I have received of the Lord that which also I delivered unto you, That the Lord Jesus the same night in which he was betrayed took bread: 24 And when he had given thanks, he brake it, and said, Take, eat: this is my body, which is broken for you: this do in remembrance of me. 25 After the same manner also he took the cup, when he had supped, saying, This cup is the new testament in my blood: this do ye, as oft as ye drink it, in remembrance of me. 26 For as often as ye eat this bread, and drink this cup, ye do shew the Lord’s death till he come. 27 Wherefore whosoever shall eat this bread, and drink this cup of the Lord, unworthily, shall be guilty of the body and blood of the Lord. 28 But let a man examine himself, and so let him eat of that bread, and drink of that cup. Notice Paul went through the happenings at Passover. Then he says in verse 26 that as often as ye eat this bread, and drink this cup. He does not say flesh and blood. And again in verse 27 he says whosoever shall eat this bread. It is literal and physical bread. This is teaching coming from James, the leader of the first church; Jerusalem. Now, whether or not you agree with all of James’ teaching, and his seeming legalistic bent, you can’t deny that he taught that believers should not drink blood. It’s straight forward; no blood. There are no exceptions taught, or mentioned. Notice in the OT verse that it is any manner of blood; it isn’t limited. Jesus did not break the Law, which can only mean He did not partake of blood at the Passover. Another issue; Christ is not bodily on this Earth. He’s seated at the right Hand of the Father. He will only return bodily, touching this earth, at the second coming. If the eucharist is His literal body, blood, soul, and divinity, then He would already be here physically, which is not what scripture teaches, so it is another contradiction. This brings me to the fact that not even the Roman church takes Christ literally. He said this is my flesh, this is my blood. However, the RC teaches that the wafer becomes not just Christ’s flesh but body, blood, soul, and divinity by transubstantiation. This idea is clearly not scriptural, even if you take His words as being completely literal. Jesus instructed the disciples to both eat and drink. The Roman POV is that you don’t have to do both, just one. This isn’t scriptural. We are to do both, first, the bread shows His body that was abused and pierced for us, second the wine, the symbol of His blood shed for us. And finally, we have one really good example of what happens when Jesus turns one thing into another in scripture. He turned water into wine. When He did this it looked like wine, tasted like wine, everyone knew it was wine. With transubstantiation you do not have this. For all practical intents and purposes, to every scientific look, that bread is still bread, and that wine is still wine, not flesh and blood. We have a good basis; water to wine, to show that this is not how this type of miracle works. Why does the blood not taste like blood? Taking all of scripture into account, and by looking at the context of all of these various verses, transubstantiation is not supported, and even contradicts several key verses. I look forward to delving into the symbolic nature of Passover, that we carry out in communion in future posts, as well as whether or not we are to examine ourselves to make sure we are worthy (or for some other reason) before partaking in communion, or are we to keep our eyes solely on Christ with the acknowledgment that we are not worthy, but that we are symbolically showing His death, and remembering Him by partaking?